Harbor Daze - Hot Tub! This charming, three-bedroom, two-bath home offers an open living area, private backyard, and a large deck with spectacular views of Southwest Harbor. Immaculate and comfortable, it is an ideal place to just relax or use as a home base for all your vacation activities. Whether you are in the fully equipped kitchen, sunny dining area, or relaxing on the couch, the nautical motif, cathedral ceilings, and floor-to-ceiling windows provide a light and airy feel and great views of the harbor. 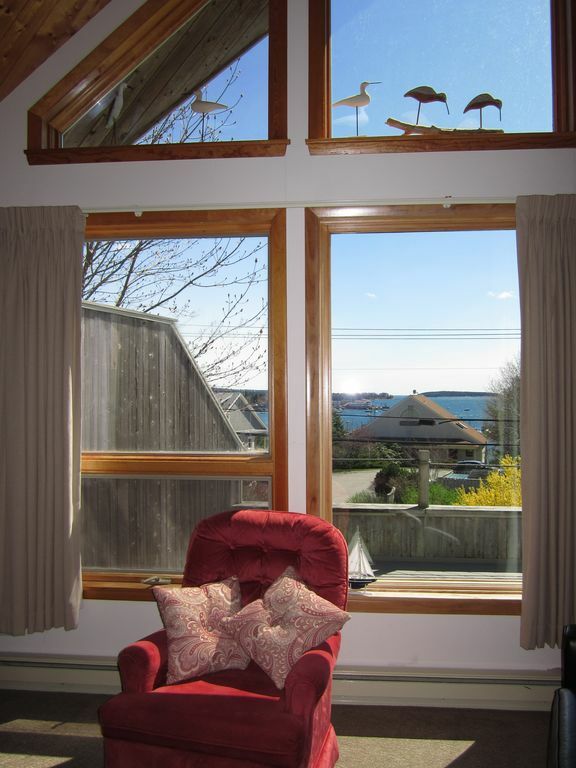 Sit at the desk in the loft to write out your postcards while taking in the view. Enjoy the sunrise over the harbor as you sip your morning coffee on the deck and watch the harbor come to life. Then enjoy all that the island has to offer, but be sure to be back in time to catch the breathtaking sunset. As the sun sets behind you, watch the light illuminate the boats in bright white with a pink glow on the entire harbor. Soak in the hot tub after a day of hiking, biking, swimming, sightseeing, shopping and adventuring. Hot Tub, Cable HD TV and wifi internet. Away from the Crowds, close to everything: Situated on the 'quiet side' of the island, you can enjoy the real Down east Maine away from the crowds, but still be within minutes of world-famous Acadia National Park and Bar Harbor. You can explore all that the park has to offer by yourself, take a guided tour or take Mount Desert Island's new bus the 'Island Explorer,' available to the public free of charge! Harbor Daze is on the Island Explorer bus route...destinations include just about anywhere you want to go on the island. Wide Range of Fun Activities: There are a number of outfitters located on Mount Desert Island that rent bicycles and kayaks as well. Just ten miles to Bar Harbor and you can enjoy a wide variety of activities from the most relaxed to the most rigorous, dining for all tastes and budgets, and shopping in many unique shops and galleries. Regardless of your interests, this cottage and surrounding attractions are sure to make for a fulfilling vacation! Come in the Fall-Beautiful Foliage, lower rates! The months of September and October are a fabulous time to come to 'Harbor Daze' House. The rates are lower, the crowds have left, the weather is comfortable and the foliage is spectacular!!! 1/4 mile from the center of Southwest Harbor village...walking distance to shops, grocery store, restaurants, marina. Plus, the house is on Island Explorer free Acadia National Park shuttle route! Master bedroom on upper level has cooling unit. Tide laundry detergent pods for your laundry convenience. Also a supply of white vinegar and baking soda. Fridge and freezer. Electric Hob and oven stove. Microwave. Upstairs level :Master bedroom has 1 queen, 2nd bedroom has 1 futon bed with twin bunk above. Lower entry level: 3rd bedroom has 1 double bed and twin bunk beds. Can sleep no more than 6 adults preferred. We love this house, this town, this island -- and Acadia National Park! We are repeat guests. We just returned home from what was, minimally, our sixth stay at Harbor Daze. My review title says it all. We will be back here to MDI and Harbor Daze in 2019. Exactly as advertised. Very comfortable. Everything was is great shape. We would definitely stay there again. Clean and very convenient to everything. We truly enjoyed our stay. The views of the harbor from the deck were wonderful to wake up to every day. The house was clean and well stocked with all we needed. We enjoyed walking or riding bikes into town, breakfast at Sips, and bakery goods from Little Notch Bakery. A memorable family vacation! We stayed in August 2018. The location in Southwest Harbor is ideal. It is a short walk to the market and a number of restaurants. We really enjoyed sitting on the deck after a day of hiking and taking in the view of the harbor. The decor and furnishings aren't new but were very clean and well maintained. The only negative thing to say is that the internet service (DSL), though reliable, wasn't fast enough to stream videos and the like. That's not really why we were there though so it wasn't an issue for us, although my children did complain. tub while we were there but everything is well looked after and maintained. The only negative might be the busy road in front of the house, with trucks going by with their trailers banging noisily. It didn't really affect our stay because all you have to do is glance out at the harbor and it fades into the background. The road is only busy part of the day and it quiets down. So much to do in this sweet town. We found a fish shack that prepares Gluten Free dishes. The owner's family member has Celiac. What a treat!! I could go on and on... This home has a retro vibe, love it! Thanks Jane for thinking of everything....CM and family. This house was just perfect and Ms. Peabody very accommodating. All of our needs were met! Cooking supplies were all there, Grocery stores conveniently listed for us, The restaurant UpperDeck across the road was amazing. Had the BEST shrimp scampi ever! We have absolutely no complaints at all, would highly recommend this house and would look to use it igain if we return to Maine. Glad you had a great stay on our island ....but.... you should say "when" you return to Maine not "if"
This home is located in the quaint village of Southwest Harbor where you can take a stroll into town and explore unique shops, fabulous restaurants, museums, antique shops, and much more. Rent a boat locally or take the water taxi to explore the waters and islands surrounding Mount Desert Island. The cottage is also located just minutes from world-famous Acadia National Park, which offers crystal-clear lakes, sandy and rocky beaches, rocky shorelines, beautifully maintained hiking and biking carriage trails, mountains to hike or drive, and so much more. Opportunities for whale watching, boat rentals and charters, fishing, swimming, tennis, shopping, kayaking, hiking, and many more are within minutes. Rates and minimum stays are subject to change until reservation is confirmed. Although some rate periods show less than a 7 night minimum, this is primarily a WEEKLY rental on a Sunday to Sunday rotation. We will CONSIDER (and solely at owner's discretion) less than a full week rental during off-peak season or if we have a last minute opening.